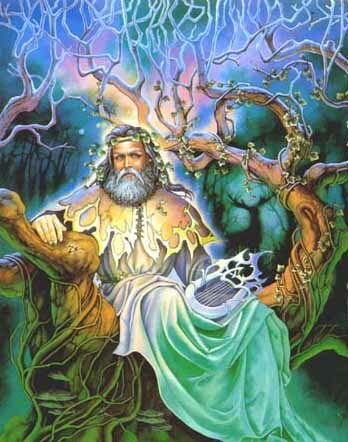 Theosophy Avalon / Ynys Witrin :- The Theosophy Wales King Arthur Pages. Holy Grail & Celtic Tradition. Wales. Ireland. Denmark. 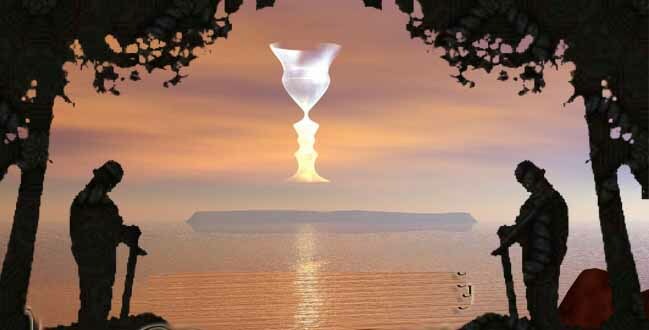 The quest for a divine vessel was a popular theme in Celtic legend long before medieval writers introduced the Holy Grail to British mythology. It appears in the Mabinogion tale of Culhwch and Olwen, but particularly well-known is the story of the Preiddeu Annwfn or "Spoils of the Otherworld" as recounted by Taliesin. 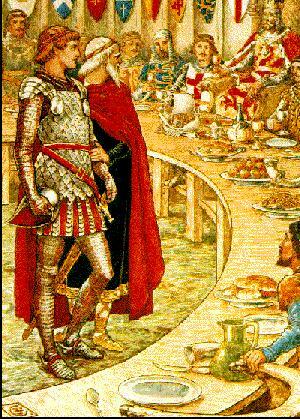 Arthur and his warriors sail off to the Celtic Otherworld to capture the pearl-rimmed Cauldron of Annwn: like the grail it was a giver of plenty, but also of prophecy. It was at last discovered at Caer-Siddi (or Wydyr), an island bound castle of glass, where it was guarded by nine divine maidens; but the ensuing perils were too much for even Arthur's men. The mission was abandoned and only seven of their number returned home. Celtic Cauldrons were used in ceremonial feasting as early as the Late Bronze Age. Ritual deposits in Llyn Fawr (Glamorgan, South Wales) included such vessels, though the best known example is the Gundestrup Cauldron found in the peat bogs of Jutland (Denmark). Highly decorated with portraits of many Celtic deities, this vessel would once have held up to twenty-eight and a half gallons of liquid. These finds clearly point to the religious importance of cauldrons, as found in the Arthurian stories and even older Celtic mythological parallels. The magic Otherworld vessel was the Cauldron of Ceridwen, the Celtic Goddess of Inspiration. She is remembered today in the archetypal hideous cauldron-stirring witch. She once set about brewing a drink of knowledge and wisdom for her hideous son, but her kitchen-boy, Gwion, accidentally tasted the concoction, preventing anyone else from benefitting from its affects. A great battle of wills ensued, for Gwion now held all the knowledge to escape the Goddess' wrath. The two changed themselves into various animals in an attempt to outwit each other before Gwion was swallowed whole as a grain of wheat. He was eventually reborn as the great bard, Taliesin! The cauldron then reappears in the story of Bran Fendigaid (the Blessed), not only as a vessel of knowledge and plenty, but also of rebirth. The great Celtic warrior God, Bran, obtained his life-giving vessel from a giantess (or thinly veiled Ceridwen) who had been expelled from a Lake in Ireland. The Emerald Isle here personifies the Celtic Otherworld. The magic vessel would restore to life the body of any dead warrior placed within it: a scene apparently depicted on the Gundestrup Cauldron. Bran's sister marries the King of Ireland and they are given the cauldron as a wedding gift. However, when hostilities between the two countries break out, Bran travels across the ocean to regain this dangerous prize. He is eventually successful, but is wounded by a poisoned spear and, like Arthur, only seven of his men return home. The name, the castle, the wound, the mystic vessel, the journey: Bran Fendigaid is clearly Brons, the Grail King, son-in-law of Joseph of Arimathea.